Genomics, Medicine, and Pseudoscience: Whatever happened to swine flu? Whatever happened to swine flu? What happened to the flu pandemic? In 2009, a new flu strain swept across the world. The new strain, called H1N1, emerged from pigs and jumped over to humans sometime in late 2008, and then swept through the human population starting in the spring of 2009. Panic ensued. Egypt responded by slaughtering all of its pigs, about 300,000. Was the panic justified? If so, where are all the victims? I first wrote about this soon after the outbreak began, and we now know that hundreds of millions of people were infected, somewhere in the range 11% to 21% of the population. That's an awful lot of sick people. However, H1N1 turned out to be a very mild flu: many people experienced little more than a few days of sniffles, much like a common cold. This surprising mildness of swine flu led to great confusion. Conspiracy theorists claimed that the threat had been overblown, hyped by vaccine manufacturers and their government co-conspirators. A wacky German lawmaker, Wolfgang Wodarg, even claimed that the swine flu vaccine caused cancer, a claim that was picked up and amplified by famed internet snake oil salesman, Joseph Mercola. The swine flu now seems routine, just another human flu circulating among the population. As I wrote back in 2010, the seasonal flu vaccine now includes the H1N1 pandemic strain, so if you get your flu shot, you're protected. But as this figure from the CDC shows, the current season has been dominated by H3N2. See the little tiny brown bits at the top of each bar? Those are swine flu cases. The swine flu has nearly vanished. This is a big surprise, because in all three of the previous pandemics: 1918 ("Spanish" flu), 1957, and 1968, the new pandemic strain completely replaced the older strain. That hasn't happened this time, and it looks like the old strain, H3N2, is winning. That's rather unfortunate, because H3N2 is a much nastier flu than the swine flu. And this year we had a big spike in deaths due to flu, all because of H3N2. So no, the panic back in 2009 wasn't justified, but the warnings beforehand, about the possibilities of a pandemic, were legitimate. 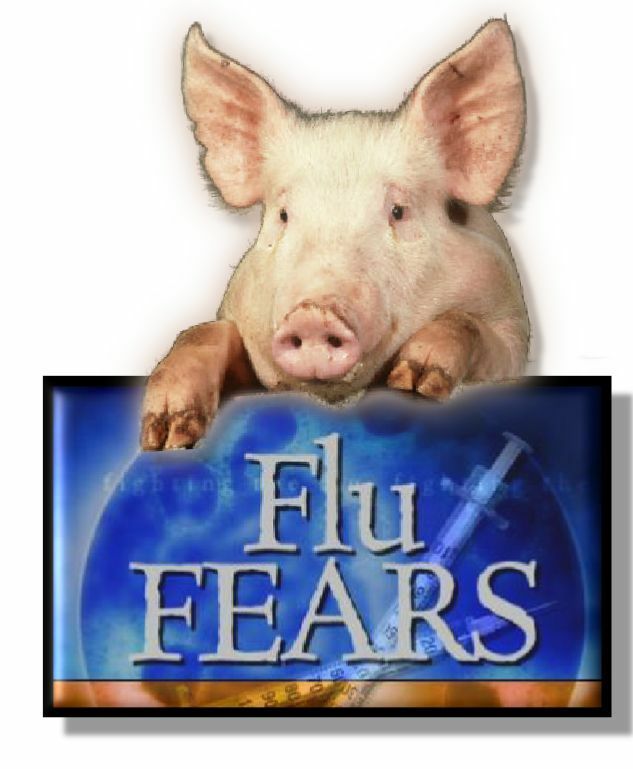 All we knew in early 2009 was that a new pandemic strain had jumped from pigs to humans, and we didn't know for several months how bad (or mild) it would be. The human species got lucky this time. Can anyone say when the next pandemic will arrive? Well, no. Look at the past century: 4 pandemics, separated by 39 years, 11 years, and 41 years. From that record it seems we should be safe for a while. But until 2009, the pandemics had always pushed out the previous flu. We're still living with the 1968 flu strain, and no one knows when a new flu will truly replace it. Meanwhile, get your flu shot, because the flu mutates so fast that we need a new vaccine every year to keep ahead of it. Work continues to try to develop a permanent flu vaccine - one that we will only have to take once in a lifetime. If you like that idea, then keep supporting NIH, which is the biggest source of funding for flu research. Oh right: we just cut NIH across the board because Congress couldn't get its act together. I guess we may have to wait a bit longer for a better flu vaccine. Since H1N1 (swine) produces a relatively mild disease compared to H3N2, then those people who go and get checked for flu are much more likely to have H3N2. These will be the viruses typed; thus, sampling differences may be skewing this data. There was also a pandemic in 1947. This virus pretty much replaced the previous strain world wide. "... Congress couldn't get its act together". While both "sides" are guilty of posturing and spinning, I think it's fair to say that Democrats are far more willing to compromise and have made numerous proposals that include revenue AND cuts, while Republicans propose ONLY cuts--cuts that will not harm those who most refuse any revenue increases (and don't tell me that canceling a tiny portion of what were supposed to be temporary tax cuts is a "tax increase"). Only made it to 2014. Now we have a "Ebola Pandemic"
A breakthrough cure for acute leukemia?